John Baird scored with the last kick of game as Falkirk fought back from two goals down to beat St Mirren in the Scottish Championship. Scott Agnew scored direct from a corner to give the Buddies the lead and Stephen Mallan fired their second. Luke Leahy headed one back for the Bairns in the second half before Baird converted a penalty following Agnew's foul on Tom Taiwo. 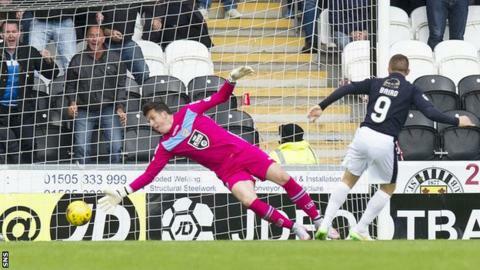 And Baird converted David Smith's pass to complete Falkirk's comeback. Match ends, St. Mirren 2, Falkirk 3. Second Half ends, St. Mirren 2, Falkirk 3. Goal! St. Mirren 2, Falkirk 3. John Baird (Falkirk) right footed shot from the centre of the box to the centre of the goal. Assisted by David Smith. Attempt saved. Lee Miller (Falkirk) header from the centre of the box is saved in the top centre of the goal. Corner, Falkirk. Conceded by Jack Baird. Attempt saved. Will Vaulks (Falkirk) right footed shot from very close range is saved in the bottom left corner. Foul by Andy Webster (St. Mirren). Lee Miller (Falkirk) wins a free kick in the defensive half. Foul by Tom Taiwo (Falkirk). Calum Gallagher (St. Mirren) is shown the yellow card for a bad foul. Foul by Calum Gallagher (St. Mirren). Tom Taiwo (Falkirk) wins a free kick in the attacking half. Sean Kelly (St. Mirren) wins a free kick in the attacking half. Foul by David Smith (Falkirk). Foul by Jim Goodwin (St. Mirren). David Smith (Falkirk) wins a free kick on the right wing. Foul by Jaison McGrath (St. Mirren). Attempt saved. Stephen Mallan (St. Mirren) right footed shot from very close range is saved in the centre of the goal. Steven Thompson (St. Mirren) wins a free kick in the attacking half. Foul by Paul Watson (Falkirk). Stephen Mallan (St. Mirren) wins a free kick on the right wing. Substitution, St. Mirren. Lawrence Shankland replaces Scott Agnew. Foul by John Baird (Falkirk). Jim Goodwin (St. Mirren) wins a free kick in the attacking half. Corner, Falkirk. Conceded by Andy Webster. Attempt missed. David Smith (Falkirk) right footed shot from outside the box is close, but misses to the left. Attempt missed. John Baird (Falkirk) right footed shot from outside the box is close, but misses to the right. Goal! St. Mirren 2, Falkirk 2. John Baird (Falkirk) converts the penalty with a right footed shot to the centre of the goal. Penalty Falkirk. Tom Taiwo draws a foul in the penalty area. Penalty conceded by Scott Agnew (St. Mirren) after a foul in the penalty area. Foul by Peter Grant (Falkirk). Foul by Sean Kelly (St. Mirren). Foul by Scott Agnew (St. Mirren). Attempt missed. John Baird (Falkirk) left footed shot from the right side of the box is close, but misses to the left.